To add extra fun to our hop, we are offering a $25 gift code to choose what you like from the PS online store. FOUR winners will be chosen at RANDOM from any of the design team blogs and the PS Blog to win the $25 prize. Deadline: You have until midnight PT on Tuesday, May 2nd to leave a comment. 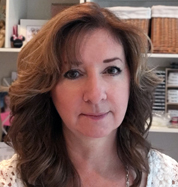 Please check the Paper Smooches blog on Wednesday, May 3rd to see if you are one of the FOUR lucky winners. Tell us that you Facebooked about our blog hop. Tell us that you Tweeted about our hop. Tell us that you posted on your blog about our blog hop. Today I have used super cute New Beginnings stamps and coordinating dies. New Beginnings stamp set is this month’s TAM (Thanks a Million) set, free to you with any $60 retail order. Be sure to hop along and comment with the rest of the DT to increase your chances of winning one of the four $25 gift codes. Thanks for visiting! Good luck, and happy hopping! Stamps: Paper Smooches New Beginnings Dies: Paper Smooches New Beginnings Icons dies Ink: Taylored Expressions Oreo, Sugar Cube; MFT Spearmint, Pink Lemonade, Berrylicious, Lemon Chiffon Paper: Taylored Expression Sugar Cube, Oreo; X-Press It Blending Card; Snap Color Vibe II Other: Copic markers, Kool Tak clear foam squares, white embossing powder, Tim Holtz Tiny Attacher, string, Simon Says Stamp sequins. This entry was posted in Clean and Simple (CAS), My Designs, Paper Smooches. Bookmark the permalink. Very sweet card!Thank you for sharing! 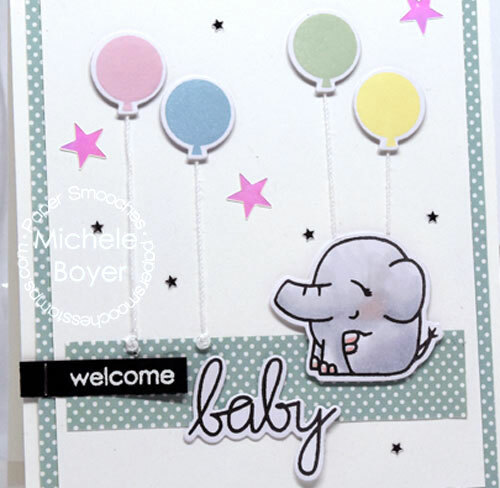 Very adorable baby card…love the cute little baby elephant image and the soft colors. That baby elephant is dang cute!! Great card and thanks for sharing. So cute! That elephant is so fun! I like the combination of colors. Thanks for the contest. I’m thankful I won. I am in love with that sweet elephant, and who couldn’t love balloons! Great card! Super adorable. Saw this on IG. Love how this could easily be a birthday card too. This is so stinkin cute! Eeek! Love! Such a cute baby card! Love his little scrunched up eyes! What an adorable baby card! Love it! OMG! Beautiful card. Love the design and the colors. I shared the blog hop on my FB page. oh my! that is SOOOO sweet! Elephants and balloons, two of my favorite things for cards, especially for baby cards. Great colors. That baby elephant is SO stinking cute! His sweet pink cheek is a wonderful touch! This card is super cute and sweet! Sweet baby card! I love the adorable elephant and the balloons! Adorable card. Love that little elephant. LOVE your dear little elephant, LOVE your balloons & stars, LOVE IT ALL! Clever card! Love paper smooches! So sweet with the elephant and the balloons. What a positively adorable baby card. I cannot wait to see this set! Such a sweet baby card! Love little Ellie with his balloons. This is just the sweetest. ADORABLE! What an adorably sweet baby card!!! Such a sweet baby card! I love that Ellie! Cute baby card. Love it! Wonderful card, love the cute elephant and balloons. So super cute! Beautiful soft colours too! Such a cute baby card! The elephant and balloons are so soft and sweet. Love baby cards. This one is too cute. What a darling baby card! I am loving this baby card… just perfect! 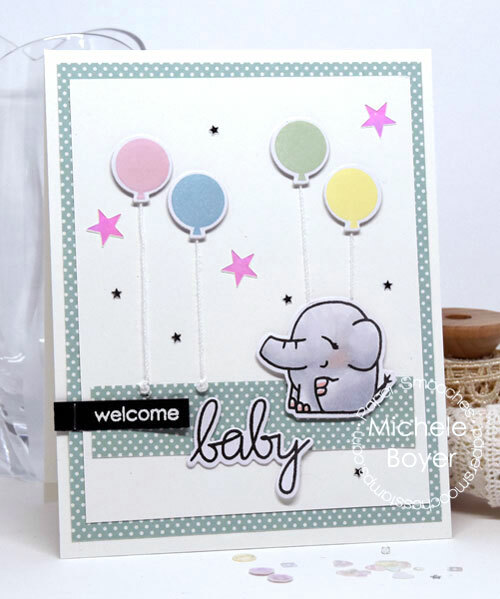 Very sweet baby card…love the balloon and elephant combo. I posted on my blog/flickr https://www.flickr.com/photos/74238397@N06/34354410936 about this release. I posted on FB about the new release/hop.